Ok, let’s see if this works… I am a big fan of Geocaching. The fascinating aspect of this leisure activity is that you can discover great places, spend time in nature, walk many miles without the necessity to catch Pokemon and have a great time with your children/family. Besides all these good properties, Geocaching allows the possibility to track items and send them to places/caches all around the world with the support of the Geocaching community. These items are called „Travel Bugs“ and have an own unique tracking number. With this number, it is possible to follow the travel route online and see its current location. Arthur starts his journey in Barcelona during VMworld 2016. The goal of Arthur is a long distance vMotion from Barcelona to the VMware Headquarter in Palo Alto for a photo at the VMware campus. After reaching this milestone it should travel all the way back to Europe, exactly to Austria. I am not sure if enough IT nerds are geocaching to support Arthur reaching his goal. But I am really looking forward to following his track online – and maybe seeing some photos. 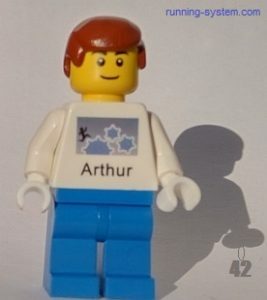 By the way, the name Arthur comes from the main character of the novel “The Hitchhiker’s Guide to the Galaxy”. I thought it would be a perfect name for my travel bug. Here you can find Arthur’s website at Geocaching.com. On this site you should be able to see his current location. Maybe you can grab Arthur and give him a lift.